Was it a blip, or a breakthrough? Scientists around the globe are revved up with excitement as the world's biggest atom smasher—best known for revealing the Higgs boson four years ago—starts whirring again to churn out data that may confirm cautious hints of an entirely new particle. Such a discovery would all but upend the most basic understanding of physics, experts say. The European Center for Nuclear Research, or CERN by its French-language acronym, has in recent months given more oomph to the machinery in a 27-kilometer (17-mile) underground circuit along the French-Swiss border known as the Large Hadron Collider. In a surprise development in December, two separate LHC detectors each turned up faint signs that could indicate a new particle, and since then theorizing has been rife. "It's a hint at a possible discovery," said theoretical physicist Csaba Csaki, who isn't involved in the experiments. "If this is really true, then it would possibly be the most exciting thing that I have seen in particle physics in my career—more exciting than the discovery of the Higgs itself." After a wintertime break, the Large Hadron Collider, or LHC, reopened on March 25 to prepare for a restart in early May. CERN scientists are doing safety tests and scrubbing clean the pipes before slamming together large bundles of particles in hopes of producing enough data to clear up that mystery. Firm answers aren't expected for weeks, if not until an August conference of physicists in Chicago known as ICHEP. On Friday, the LHC was temporarily immobilized by a weasel, which invaded a transformer that helps power the machine and set off an electrical outage. 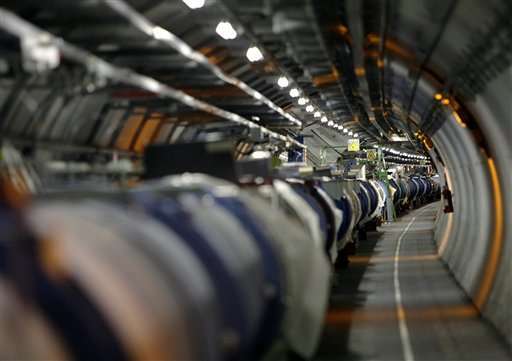 CERN says it was one of a few small glitches that will delay by a few days plans to start the data collection at the $4.4 billion collider. The 2012 confirmation of the Higgs boson, dubbed the "God particle" by some laypeople, culminated a theory first floated decades earlier. The "Higgs" rounded out the Standard Model of physics, which aims to explain how the universe is structured at the infinitesimal level. The LHC's Atlas and Compact Muon Solenoid particle detectors in December turned up preliminary readings that suggested a particle not accounted for by the Standard Model might exist at 750 Giga electron Volts. This mystery particle would be nearly four times more massive than the top quark, the most massive particle in the model, and six times more massive than the Higgs, CERN officials say. The Standard Model has worked well, but has gaps notably about dark matter, which is believed to make up one-quarter of the mass of the universe. Theorists say the December results, if confirmed, could help elucidate that enigma; or it could signal a graviton—a theorized first particle with gravity—or another boson, even hint of a new dimension. More data is needed to iron those possibilities out, and even then, the December results could just be a blip. But with so much still unexplained, physicists say discoveries of new particles—whether this year or later—may be inevitable as colliders get more and more powerful. Dave Charlton, who heads the Atlas team, said the December results could just be a "fluctuation" and "in that case, really for science, there's not really any consequence ... At this point, you won't find any experimentalist who will put any weight on this: We are all very largely expecting it to go away again." "But if it stays around, it's almost a new ball game," said Charlton, an experimental physicist at the University of Birmingham in Britain. The unprecedented power of the LHC has turned physics on its head in recent years. Whereas theorists once predicted behaviors that experimentalists would test in the lab, the vast energy being pumped into CERN's collider means scientists are now seeing results for which there isn't yet a theoretical explanation. "This particle—if it's real—it would be something totally unexpected that tells us we're missing something interesting," he said. In energy, the LHC will be nearly at full throttle—its maximum is 14 TeV—and over 2,700 bunches of particles will be in beams that collide at the speed of light, which is "nearly the maximum," CERN spokesman Arnaud Marsollier said. He said the aim is to produce six times more collisions this year than in 2015. "When you open up the energies, you open up possibilities to find new particles," he said. "The window that we're opening at 13 TeV is very significant. If something exists between 8 and 13 TeV, we're going to find it." Still, both branches of physics are trying to stay skeptical despite the buzz that's been growing since December. Csaki, a theorist at Cornell University in Ithaca, New York, stressed that the preliminary results don't qualify as a discovery yet and there's a good chance they may turn out not to be true. The Higgs boson had been predicted by physicists for a long time before it was finally confirmed, he noted. "Right now it's a statistical game, but the good thing is that there will be a lot of new data coming in this year and hopefully by this summer we will know if this is real or not," Csaki said, alluding to the Chicago conference. "No vacation in August." Shall we name it after the deceased weasel? but has gaps notably about dark matter, which is believed to make up one-quarter of the mass of the universe. Theorists say the December results, if confirmed, could help elucidate that enigma; or it could signal a graviton—a theorized first particle with gravity—or another boson, even hint of a new dimension. "New particle called the ParticleMCParticleFace discovered at LHC!" A new dimension, I think. It would be completely unprecedented in my opinion. Dark Matter particles, gravitons, are strongly suggested by current physical observations, and we already know about bosons (though, not this particular hypothetical one). Extra dimensions are still firmly the stuff of science fiction. This is not to say that finding a new dimension would be most valuable, just the least expected in my opinion. Hmm...I hope you don't think quark was brilliant. Quarks are short with big ears. They keep trying to use dark matter as the solution to the misunderstood. The gravitational anomalies observed ( blamed on dark matter) are merely interdimensional gravitational waves close to the surface of our dimension with enough energy to cause the gravitational waves to bleed through to our dimension. If they quark like a duck, then _____. Every particle has already been created. They can be split but what they contain was already in them. Nothing new under the sun...er..stars. Lots of scientists who have built their careers on the status quo are upset at this, and hope it will go away. However, those who know ARE scared to just 'let it go', for that would give the field to hostile actors in the world who WILL work on this and who give a fat damn about some schmo in a comfortable lab job in...say....Antwerpen who just wants to continue to make money with nonsense reports and pathoskepticism. That said, science will march on in its higgledy-piggledy way and muddle through. Gravitons if they exist would postulate by their existance an 'anti'graviton as well. Such a thing would be exceedingly useful to exploit. Can see a truly advanced culture doing a thought experiment: suppose a stellar mass of these anti-gravitons were dumped into a black hole of small enough sized to destabilize it......Of course, 'keeping those particles from flying apart would be a problem'. Suggesting a nice, short French word to call the new? particle...Voila! minus the exclamation point. Let's call it George. I always thought that would be a good name for God, too. Give at least one example and be careful bvecause of so many lies to not lose the ability to recognize the truth, which is determines the future of all people in etenrnaty. It's good to learn proper determine your priorities. On they contrary, they did it many times. What have you been smoking? You are as wrong on physics as you are on religion. The layman in question is a particle physics Nobel prize winner. How wrong can you be, PO? Leon Lederman dubbed it the "Goddamn particle"...because it was so elusive. The "God particle" thing is an invention by his publisher. Good thing the missus found sperm donors for "your" children. "Buzz". As in, marketing. See "creating a buzz". The deceased marten had a name? Next I'm going to be hearing someone claim it was a Syrian refugee. Oh, and for all those that think they're not affected by cutesying up the story for the idiot public, weeks later you're universally saying "weasel" because one headline wanted to write "pop goes the weasel". Popularizing science...oh, look. That brings us back to funding. And marketing.